Venue: International Environment House, Châtelaine-Geneva, Switzerland. 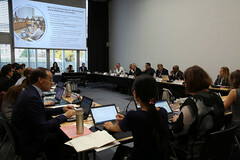 Highlights: The bureaux of the conferences of the Parties to the Basel, Rotterdam and Stockholm conventions finalized the organization of work of the meetings of the conferences of the Parties to the Basel, Rotterdam and Stockholm conventions taking place from 29 April to 10 May 2019 in Geneva. The bureaux also discussed other organizational matters related to these back-to-back meetings. Working Language: The working language of the meeting will be English. Participants: By decisions BC-11/25 and SC-6/29, the conferences of the Parties to the Basel and Stockholm conventions decided that five members of their bureaux may participate in the joint meetings of the bureaux of the conferences of the Parties to the Basel, Rotterdam and Stockholm conventions, having due regard to the principle of equitable geographical representation of the five regions of the United Nations.